Without Tolkien, Lewis may not have become a Christian. Without Lewis's encouragement, Tolkien may not have finished and published The Lord of the Rings. This highly readable and insightful "biography" of their friendship will be of interest to fans of Tolkien's and Lewis's work, presenting the synergy that their relationship created in a synergistic manner of its own. The information about World War I, medieval literature, literary criticism as approached at Oxford and Cambridge, and the personal lives of these two great authors is interesting, but the place of their work in the history of literature--when they wrote, there was almost no literature that created "other worlds" for adults--clinches the importance of their contributions. Have you "heard the horns of Elfland"? Have you wanted to discover the road that will lead you beyond the world? Inspiring book about two seminal figures--be prepared to reread their work after you learn more about its creation. This is not the book to read at bedtime. I think I didn't get as much as I could out of it because I was always sleepy while reading it. But here's my take on it: It was basically two parallel biographies about two people whose lives happened to overlap. They taught at the same college and were members of the same writing club. The author kept saying, over and over, how important the friendship was, but he never showed it. Maybe because I was already familiar with the basics of their friendship, is why I felt dissatisfied with this book. I wanted it to go a lot deeper than it did. However, if you're a fan of both Tolkien and Lewis, but don't know about the Inklings, you would really like this book. It's a good introduction to their lives, views on fantasy literature, and their faith. For all the emphasis on their friendship, though, I thought the author almost made the opposite point. After reading this, it seemed like they were less close than I thought, even though I'm pretty sure the author didn't mean for me to get that impression.I've also read another book co-written by Duriez, a coffee table book about the Inklings, and I LOVED it. Maybe I just need to read that again! Or read this one not when I'm half asleep. A wonderful biography for readers interested in these two authors' lives and thoughts as well as their works. Lewis and Tolkien were sufficiently entangled with one another's lives that it is difficult to tell the story of only one of them. And anyway the whole is more interesting than its halves taken separately. As with Shelley and Byron, or Wordsworth and Coleridge, the interplay between them is highly revealing of their natures.Duriez makes his own voice pretty evident, for better or for worse. He begins each chapter with a few paragraphs of novelistic narrative, a reimagined scene from the lives of his subjects. It's at once tantalizing and graceless; Duriez is too obviously delighting in the chance to indulge his vision of the men he idolizes a bit too much to handle in this mode. He is a bit too circumspect at times, also, in a way that may relate to his own mildly stuffy Christianity: notably, he is delicate to the point of reluctance when mentioning the possibility that Lewis and the older woman with whom he lived for twenty-odd years may have been romantically involved. He dwells on Lewis' more theological writings and lectures sufficiently that the book feels a bit unbalanced, as though it is sixty percent a biography of Lewis.But all of that is trivia. It's simply lovely to hear the generations-old gossip of what these two remarkable professors had to say to one another. Alas, all books about amazing people are not amazing themselves. This book read as a biography of both Tolkien and Lewis, though set side by side chronologically. I learned a few new things about Tolkien, and a bit about Lewis, though all of which I would rather read in a full biography, not one on the two men's friendship with one another. Lost in the book was any sense of them being friends, due to the sparsity of quotes from one about the other and also simply the patch-workness of the whole endevour. Luckily the last chapter was full of their collective ideas, though done rather speedily. I got a good bit of thinking done due to the book, and thinking I have not been able to approach for quite some time, though this is due not to the book, but to the brilliance that are Tolkien and Lewis. A good biography of the two greatest Christian Fiction writers of the 20th Century - C.S. Lewis and J.R.R. Tolkien and their friendship together. I didn't find the book too incredibly interesting because I knew a lot about their friendship before, but if you don't I highly recommend it. An interesting read, and helpful in its purpose; not something I'd recommend as bedside reading, but helped with my Extended Project dissertation, so I can't fault it. Two half-books for the price of one full bookColin Duriez has managed to write two mediocre biographies of two inherently interesting men, but what this book brings is many of the points of connection between the two. Friendship is the word Duriez uses and in many respects their relationship (at least initially) had all the passion of friendship. But passions cool with age and while C.S. Lewis maintained his energy and combativeness J.R.R. Tolkien deepend as a thinker and fell into academia and family life much more comfortably.Lewis emerges as a kind of Christopher Hitchens populist with infinite energy devoted to pointing against whichever way the winds are blowing like a weathervane. Tolkien is the more somber thinker, the more sensitive soul who retreats deeper into his own richer world. Perhaps this is why I prefer the writings of Tolkien to the pamphleteering of Lewis.Duriez attempts to tie Lewis' Protestantism and Tolkien's Catholicism as the inspiration for their fiction but I think he doesn't connect the dots sufficiently well. Lewis' writing remains superficial allegory because his religion remained a mere expression of his tastes and upbringing. Tolkien's writing and world is much more complete because he is used to living in a deep world, not bound by national boundaries but by an underlying conflict between good and evil. This is the reason for Tolkien's near universal popularity. Tolkien sensed this and this is why he cooled the relationship. It will work best for newcomers to Lewis and Tolkien's stories (those who haven't read their respective biographies or stories [Duriez summarizes LOTR, The Narnia series and most of the other notable works by both authors), and the conclusions are nothing new. Still, a compelling look at the lives of two great men and their monumental friendship. An excellent biography of Lewis and Tolkien and their extraordinary friendship. A must read for fans of both authors! A very good biography of these two remarkable men: each of whom started out as young and imaginative professors at Oxford but both would go on to become two of the most popular writers and intellectuals in the 20th Century, each of them in their own peculiar way (Tolkien in the subtle hints of fantasy, Lewis within his allegory and Christian apologetics) would become two of the Anglo-American world's biggest critics of modernity and two revivers of the power of imagination as a beacon of truth. While it could have been written better in some areas, it provides a good history of both the men and their friendship as well as some very interesting information about meetings of The Inklings. Tolkien and Lewis were two very different men. The differences can probably be observed in their most popular works, The Lord of the Rings trilogy and The Chronicles of Narnia, respectively. Tolkien's work took his entire life to write it, and is definitely a labour of love. He also criticised Lewis' Narnia - deriding it because it was a fairy tale for children - Tolkien firmly believed magical worlds should be created for adults, not only children. Tolkien also disagreed with the speed in which Narnia was produced, seven volumes in seven years. I found it sad that Lewis served as an inspiration for Tolkien's work, and Tolkien himself says that the trilogy would not have been published without Lewis' support. Tolkien did not support Lewis with Narnia at all and it was almost not completed. Tolkien was very judgemental of Lewis and his choices in life which meant their friendship cooled off in the last 10 years of Lewis' life.This is a great story that traces the life of two amazingly gifted writers. I never even knew these two were contemporaries let alone each other's inspirations. They enjoyed each other's company and were able to explore and tease out themes and ideas that needed reconciling in their literary works. They also believed that Machine Age (modern age) was wrecking the fairytale by concentrating on the real world and not creating other worlds - which they sought to rectify by creating these worlds themselves. These two were a major influence for each other and the literary world is better off for them knowing and confiding in such a rich friendship. An enjoyable review of the parallels and intersections of two of the great Oxford scholars of the 20th century. We tend to know more about Lewis, for better or worse, from his many popular theological writings. But Tolkien truly shines in this book as a scholar and creative genius. Some of the techniques the author uses can be distracting (using the present tense to have the reader imagine a particular episode), but overall he helps the reader get to know the two main characters and well as other important people in their lives like Charles Williams and Joy Davidman. Although this is not a typical biography (for example, there's no sense that the author interviewed any of Lewis's or Tolkien's family members or friends), the author presents a nice literary and personal sense of their lives. For someone who has read standalone biographies of Tolkien and Lewis (or Lewis's autobiographical works), I think I can recommend this book without many reservations. Then again, for readers who are uncomfortable with Christian writers - who are generally conservative - or their messages, this may not be a satisfactory book. Tolkien's diary: "Friendship with Lewis compensates for much, and besides giving constant pleasure and comfort has done me much good from the contact with a man at once honest, brave, intellectual - a scholar, a poet, and a philosopher - and a lover, at last after a long pilgrimage, of Our Lord. ""But as the group (Inklings) expanded, partially by embracing Charles Williams, he began to feel somewhat left out from Lewis's attention. The dynamics of the larger group worked for Lewis, but did not seem to work from Tolkien. Jealousy is too strong a word for Tolkien's feeling of loss; it was more perhaps a gradual and barely articulated hurt. He was a warm and generous man, however, and continued to particpate in the Inklings, showing affection and interest to each member. "On the whole, an excellent resource and starting place for anyone interested in learning just a bit more about Tolkien, Lewis and their friendship. For anyone who has done some research into either of them, none of this is new information, but it is well presented. This work compares and contrasts the lives of these two authors and illuminates the influence they had on each other, specifically Tolkien's influence on Lewis regarding Christianity and Lewis's influence on Tolkien regarding fantasy. The frame of this biographical work is set up so that each chapter covers the same period in both writer's lives; the reader is able to "observe" how their lives begin separately in Ireland and England; converge in the academic world at Oxford; and separate gradually with the years and life choices each man makes. An insightful look into a friendship which bore literary fruit that continues to impact the world today. 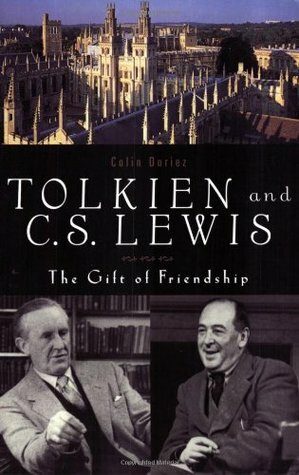 A well-written history of Tolkien’s and Lewis’ lasting and interesting friendship. Duriez provides great coverage of such topics as their wartime service, their religious and disagreements, their influence on each others’ works, and Tolkien’s role in converting Lewis from atheism to Christianity. We see how CS Lewis came to love Tolkien’s works, while Tolkien’s opinion of Lewis’s work was decidedly mixed. We see how Tolkien was largely responsible for Lewis’s securing of a position at Cambridge (after being denied at Oxford).Readable and interesting. I am loving this book, though it is definitely not a quick read! I find that this is more of a Sunday-afternoon type book since I don't like reading it at bedtime.The histories of these two remarkable authors are woven together beautifully from childhood. I love to see not only the parallels between these men, but also the influences that are apparent in their writings, particularly those of the fantasy genre. I am only now reading about their early friendship at Oxford and I look forward to delving further into thier unique and influential relationship. This chronicles the on again/off again relationship between these two members of the "Inklings", an elite group that met to enjoy each other's erudite company. I believe G. K. Chesterton was also among them, as well as some lesser lights. It also describes Lewis' conversion experience. He and Tolkien had very different ideas on the extent to which the laity ought to publicly speak about the faith. If you're a fan of MiddleEarth and Aslan, you'll probably enjoy this book. I am not a great fan of biography but am fooled once in a while and actually enjoy the read. And I enjoyed this book. Partly I suppose because I am a fan of both authors, partly because I am a fan of their intellects. And partly because Duriez weaves the friendship into a tale and I feel I got to know these two towering figures better. So I'm sort of a Tolkien/Lewis geek. I read all of their books in high school and fell in love with their writing style and content. This book is sort of a look into their friendship. It is extremely interesting and very easy to read. To hear about their relationship and how they challenged each other. You also get a glimpse of Tolkien's wit and Lewis' wisdom. Check it out. Good biography of Lewis and Tolkien. I especially like the way it weaves together their lives and gives some good coverage to many of the milestones. One drawback is that the narrative switches back and forth from Tolkien to Lewis, which takes some getting used to in the early chapters. Overall, a good text for the classroom or the personal library. An excellent account of the friendship between C.S. Lewis and J.R.R. Tolkien and how these two master storytellers inspired and challenged each other to grow in their writings, literary teaching work, Christian faith, critical thinking, and the quest for an understanding of how God writes an epic, classic story in the lives and hearts of men. Enjoyed reading about the friendship of these two writers - how their lives intertwined and how they encouraged one another. "Friendship, like the fantasy tale, gave a person a vantage point to see the world in a fresh way. Friendship with Tolkien, he [Lewis] found, shook him fully awake, out of the cold dream of materialism." This not a good book. It bounces around and adds information about other people that I don't care to know. I will say the book identified that I wanted to know more about L&T and read more if their respective works, just not by this writer. I thought it was interesting how Lewis encouraged Tolkien to write Lord of the Rings while Tolkien helped Lewis realize that God existed. It was sad that their friendship drifted towards the end but they definitely were instrumental in each other's lives. As a lover of both Tolkein's Lord of the Rings books,and Lewis' Narnia series (as well as his Chrisitan writings)I was interested in their relationship. I knew a little of Tolkein's influence on Lewis' return to Christianity, so this book was really interesting. I began this book with little knowledge of the lives of either of these 2 great men. But I like to think that I know and understand them a great deal better after reading this. I enjoyed getting a feel for how Lewis and Tolkien influenced each other.